Freeze especially your children's animals. Before you call the SPCA on me, understand that I'm talking about stuffed animals. Those who get loved so much. Who get carried around, petted and hugged. And - sometimes - left behind in dusty corners. Or get loved by the dog or cat (or, for that matter, serve as a nice comfy pillow for dads). All that loving makes a stuffed animal collect dander, and therefore dust mites. Pretty soon, the beloved animal turns into a fearsome source of allergens. While the preferred way to get rid of dust mites is by laundering in hot water, you can't very well do that with stuffed animals - even if you did get permission for such a dastardly deed as drowning them in the washing machine. But there's another way: dust mites don't survive freezing. So every winter, I wait for a good hard freeze. Then I organize a "camping trip" for the stuffed animals. It's a grand party: they all get to come and spend the night outside. Blankets are welcome too (it will all get frozen by the morning, anyway). 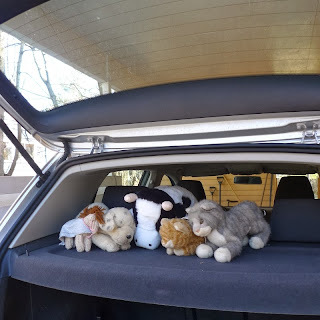 How to prevent real animals from kidnapping your children's beloved stuffed ones? Why, put the camping trip in the car. Arrange the animals according to their preferences, each close to its favourite buddies. Admonish them not to make a ruckus. Then wish them goodnight, and close the car door (No, this is the animals' private camping trip, children get to sleep in their own beds. Inside the house). In the morning, enjoy the reunion. Then warm the animals in the room before putting them in the drier (on hot) to get rid of all the dander and dust mite droppings that are the cause of allergies. Unlike drowning in the washer, tumbling is fun. I do the same with our bedding, which also doesn't fit in the washing machine: this has to happen during the day unless you camp out on sleeping mats for the night. Haul your mattresses / futons, pillows, wool blankets and rugs outside into a good hard freeze. (This stuff is too large to fit in my car, I drape it over our patio furniture). Chill thoroughly. Then beat with a mattress beater, those things that look like a tennis racket and give a satisfying whack! and cause dust to billow out. You can vacuum clean it for good measure, but by this stage I'm usually pretty beat, and leave the vacuuming to another day. Very important: Remember to bring it all back in several hours before you plan to have anyone sleep in it. It takes a mattress a long time to warm up! LOL - I love it! And, yes, those animals are a pain to wash and never get completely clean. I should have hauled them out to the car today; it's a balmy 14 degrees out there. What a great idea! We have so many stuffed animals that could use this! This is fabulous! I love the idea! Great idea! I've read about putting stuffed animals in the freezer, but my freezer is full. I love the idea of taking them outside and keeping in the car or the breezeway. I need to do the same with the bedding. OMGoodness ... what a great post ... and too fun with the camping trip & tumbling adventure! When I was a kid, I had a dog (Boscoe). He was a knit dog made by my grandmother. My mom would sneak him into the washing machine when I was napping. But one day, I wandered into the laundry room just in time to see my beloved Boscoe take a dive into the washer. I've blocked the sad event from my memory ... but my mother tells me I sobbed. Oh that she would have known about your fun activities. :-) Thanks for sharing ... and I love the mattress idea! Oh no! sorry to hear about Boscoe, even now. It really can be traumatic for children, their animals are so alive for them. Save The .... Tennis Players?